Older adults’ living arrangements are linked to their assessments of their financial comfort, social lives and relationships, and lifestyle, according to an analysis of Pew Research Center survey findings. In general, older men who live alone are less likely to be satisfied with their social lives than men who live with others or women in any living arrangement. And men who live alone are less likely than women to say they experience some key benefits of aging, such as spending more time on hobbies. Older adults living alone are less likely to describe their financial situation favorably than those living with others. One-third (33%) of older adults living alone say they live comfortably, compared with about half (49%) of those who live with others. 12 Roughly a quarter of each group say they have enough to meet their basic expenses with a little left over for extras. Another quarter of older adults living alone say they have enough to just meet their basic expenses. Among older adults who live with others, slightly fewer (16%) describe their financial situation this way. Older adults living alone are roughly twice as likely as those who live with others to say they don’t even have enough to meet basic expenses (12% vs. 5%). These survey findings are in line with census data indicating that older Americans who live alone are about three times as likely as those who live with others to be poor. In 2014, about one-in-five (18%) older adults living alone were in poverty, amounting to 2.2 million older adults. 13 By contrast, 6% of older adults living with others in 2014 were in poverty. This is especially true of women: 19% of older women who lived alone were in poverty in 2014, versus 15% of comparable men. Among older Americans who lived alone, 1.6 million women lived in poverty compared with 600,000 men. However, older women in any living arrangement are more likely to be impoverished than older men. Among older adults who live alone, there are striking differences between men and women when examining key aspects of their social lives. In general, older men who live alone are considerably more likely to experience social isolation than women who live alone. Overall, similar shares of older adults living alone and those living with others say they are “very satisfied” with the number of friends they have. However, men who live alone are considerably less likely than men who live with others (and women in any living arrangement) to say they are very satisfied with the number of friends they have. About half (48%) of men who live alone say this, compared with 62% of men who live with others. By contrast, women who live alone (71%) are just as likely as women who live with others (67%) to say they are very satisfied with the number of friends they have. Nine-in-ten older adults living with others say they are in contact with their children at least weekly, compared with 80% of those who live alone. About four-in-ten in each group say they communicate with their children on a daily basis. The differences by living arrangements are much greater when looking at contact with grandchildren. Among older adults with grandchildren, 43% of those who live alone say they are in contact with their grandchildren on at least a weekly basis, compared with 60% of those living with others. 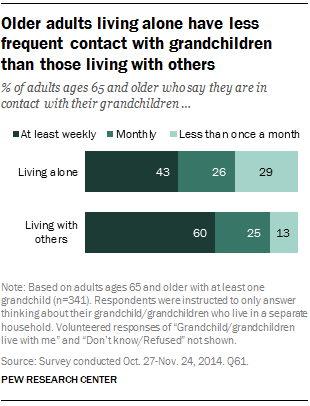 By contrast, older adults living alone are about twice as likely as those who live with others to say they communicate with their grandchildren less than once a month (29% vs. 13%). One common advantage of aging is having more time to spend with family members. But older adults living alone are less likely than those living with others to say they experience more time with their family and grandchildren as they age. 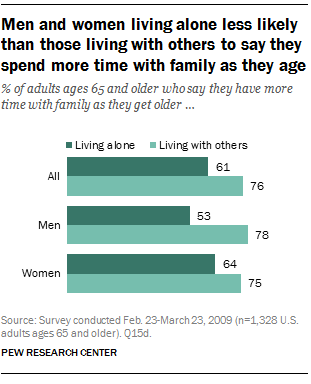 About six-in-ten older adults living alone (61%) say they have more time with family as they age, compared with 76% of those who live with others. Both men and women who live alone are less likely to say this than their counterparts who live with others. Among older adults with grandchildren, those who live alone are substantially less likely to say they are spending time with grandchildren as they age (65% vs. 78%). The gender differences in the share living alone who say they do experience this more as they age are slight – roughly two-thirds of men and women say this. But most older adults with adult children in either living arrangement say they get enough support from their adult children (76% who live alone and 78% who live with others say this). About one-in-ten older adults living alone (8%) and living with others (10%) say they do not get enough help from their adult children. Roughly 1% of each group says they get too much help. For some, aging brings more free time for activities such as hobbies or volunteer work. But older adults living alone are less likely than those who live with others to say they spend more time on these activities as they age. And in some cases, this is particularly true for men who are living solo. Six-in-ten older adults who live alone say they spend more time on hobbies and interests as they get older, compared with about seven-in-ten (69%) who live with others. There are considerable gender differences in the share of older adults living alone who say they spend more time on hobbies as they age. Among women who live alone, 65% say this compared with 49% of comparable men. However, similar shares of women who live alone and with others say they spend more time on hobbies and interests as they age. By contrast, men who live with others (73%) were substantially more likely than men who live alone to say this. Older men who live alone are also more likely than their counterparts who live with others to say that, as they grow older, they are doing volunteer work or getting involved in their community. Roughly four-in-ten men (42%) and about half of women (49%) who live alone say this. By comparison, 56% of men and 55% of women who live with others say so. Older adults who live alone are marginally less likely to say they travel for pleasure than those who live with others (47% vs. 55%). About half of older men and women who live alone say they travel for pleasure as they grow older (50% and 47%, respectively). Similar shares of older adults who live alone (59%) and with others (60%) say they have less stress in their life as they age. There is no statistical difference between the shares of older men and women who live alone who say this (58% of men and 59% of women).